In the 1970ties, working at IBM, Zachman met P. Duane “Dewey” Walker, who had established an enterprise analysis-oriented planning tool called Business Systems Planning (BSP), that is concerned with this same trade-off. Resuming BSP in 1982 (39-41), Zachman relates this difference of the time frame to a BSP-matrix, that combines the data on the one side and the processes on the other. BSP “is seeking to develop a stable foundation for architectural use”, whereby the stability is found in the what (the finite data), whereas the variability is found in the how (the infinite processes). Zachman puts the spotlight on this search for an architectural foundation, as a way to resist short term gratification: that might well be the maxim of Zachman. Expressing the enterprise’s duty of choosing rational and informed, as to balance “the short term demand and at the same time build something coherent over time”(1999). And it is this same coherent building perspective for the long term time frame, that is behind Zachman’s gesture of introducing a framework for architecture in the 1987 in the IBM Systems Journal. Already in 1982, it is clear to Zachman that BSP and others “likely will be looked back on as primitive attempts to take an explicit, enterprise level architectural approach” (1982:32). The Zachman framework for architecture is the next step: less primitive, more sophisticated. Promoting Zachman to “being the kind of nominal heir” of P. Duane “Dewey” Walker (2007:3). The introduction of a framework for architecture, as a stable foundation, creating consistency over time, fulfills the need for “some logical construct (or architecture)” for “rationalizing the various architectural concepts and specifications” (1987:276-277). It’s important to recognize that Zachman did not introduce architecture itself. The term architecture was already very common.2 Introducing in 1978 another framework that Zachman thought we might need (a framework for planning), he states: “architecture is a term that is rapidly losing its meaning because it is being used to describe many different things by many different people” (1978:9). In 1987 he repeats the same statement, adding that “the emotional commitment associated with vested interests almost demands a neutral, unbiased, independent source as prerequisite for any acceptable work in this area” (1987:277). The term architecture is used metaphorically, as the proper field of the term is that of buildings, whose history, according to Umberto Eco (1973:13) started in the Stone Age, as soon as an “idea of the cave” took shape as a possibility of (the function of) shelter. Using architecture as a metaphor presupposes that there is some-thing that shows similarity to the proper use of the term. But identifying that similarity was and remains an issue: many different things are all referring to the same term. As if everyone carries another dictionary, with their own definition of the essence of this “thing”, similar to architecture as we know it. The framework for architecture is one of those definitions. Introduced as an attempt to restore the meaning of this “thing” called architecture, that did lose his meaning due to all the discordances. A definition based on a neutral source: “In searching for an objective, independent basis upon which to develop a framework [...], it seems only logical to look to the field of classical architecture itself” (1987:277). Re-identifying the similarity of the “thing”, hiding behind the architectural metaphor. Twenty years later, Zachman repeats this gesture in his article Architecture is Architecture is Architecture (2007-2011): defining “what architecture is”, because the gross misunderstanding persists. The discordances beforehand, become misunderstandings afterwards. People just do not understand it and they continue to use a “kind of Architectural malapropism”3: definitions that sound like architecture, but actually aren’t architecture at all. As far as Zachman is concerned, people simply don’t get the essence of what architecture really is. On the one side, there is a framework. On the other side, some-thing called architecture. Zachman tries ceaseless to frame the meaning of architecture within the framework. But, due to the metaphorical use, the term architecture evokes a lot of things that are foreign to the framework. So either people start pushing the framework aside or they re-frame it. In both cases, it is the framework that disappears. Intended for architecture, that same architecture makes the framework dissipate. A framework for architecture got rapidly popular as The Zachman Framework: the common name (architecture), is substituted by a proper name (Zachman). In rhetoric’s this change is known as an antonomasia, like using the name Solomon instead of wisdom. From a rhetorical point of view, the Zachman framework for architecture is somehow equal to Solomon’s judgment for wisdom. The field of wisdom might even incorporate as much discordances as that of architecture. But in the end, Solomon is and remains the one and only real thing in the land of wisdom: referring to Solomon, implicitly includes a “wise” judgment. Using the name Zachman instead of architecture, does have the same effect: it evokes the guarantee of doing the real thing in the field of architecture. Even if what is being done, has nothing to do whatsoever with the framework. There are architecture tools, claiming to support Zachman for marketing reasons, which do lack the support (as it should be). There are other frameworks for architecture, who feel the urge to map their framework to the one from John A. Zachman: look, mine is doing exactly the same! Trying (desperately) to prove they are doing the real thing: architecture as invented by the founding father John A. Zachman. But in the end, the use of the proper name only makes disappear the one and only thing Zachman has actually founded: a framework. The reception of the Zachman framework for architecture since the 1980ties is profoundly marked by these two movements, exercising the rhetorical power of language: defining architecture differently as comprised by the framework and/or in linking a framework for architecture directly to the proper name of the founding father. In both cases, at the expense of the framework, that is totally sidelined and disappears from the scene. This essay aims to get the framework back on track: what is it, that the framework itself is framing? Any answer to this question is not limited to choosing the right words. It is foremost about understanding the rationale of the framework: what capability for reasoning, does it imply. Only in understanding the way the framework reasons, we can grasp the object it is trying to frame. When Zachman (2007-2011) is describing architecture as “the set of descriptive representations”, he is referring to these two basic ideas, combined in the framework. The representations are hooked up to the subject: a viewpoint determining what a participant can perceive from an object, the way it appears. The descriptions are hooked to the object: like sounds and graphs, they provide the conceptual aspects for reproducing the product. In combining these two ideas into a matrix, every element in the framework emerges necessarily from an explicit relation between a subjective perspective and an objective description. This grants the framework an epistemological foundation, because it determines how a subject is able to apprehend an object from a specific perspective, by means of certain (describing) concepts. The explicit presence of the subject in the framework is important. Zachman & Sowa (1992:590) characterize the framework as providing a taxonomy. But any classification activity, resulting in a taxonomy, is necessarily done from some subjective perspective, decisive for what aspects are (not) pertinent. In a taxonomy, this subjective perspective remains implicit. As it is remains implicit in the periodic table of Mendeleev: also a matrix, but it only contains the conceptual aspects to describe the object, like the atomic number and the periodicity of chemical properties. The framework does have an explicit subjective perspective: it is not only a description, but at the same time also a representation. The framework constitutes specific knowledge in representing an object from an explicit subjective perspective, while describing it with pre-established concepts. But the framework is not limited to one subject. It represents different perspectives for the different participants. Technical drawings, made by engineers, use the same principle: they are projecting one and the same object from different perspectives. For example, an exploded viewpoint shows the relation between the parts to be assembled into an object. Or an isometric viewpoint uses an angle in which all axes of the object appear as equally. Different viewpoints on the same object, all showing the same object differently. The metaphorical use of the word architecture seems to emanate mainly from this principle of different perspectives. When Zachman returns to classical architecture in 1987, as a neutral, independent source to re-define architecture, he stumbles on this idea of different perspectives on the same object. Describing the architecture of a system, the IBM 360, George M. Amdahl justifies in 1964 the use of the term architecture with exactly the same reason. Because of the intermodel compability between machines, a new concept of mode of thought was required: “to make the compability objective even conceivable. [...] computer architects had realized [...] that logical structure [of the system] (as seen by the programmer) and physical structure [of the system] (as seen by the engineers) are quite different. Thus each may see [something] that to the other are not at all real entities” (Amdahl, 1964:23-24). The explicit recognition of the duality of structure (of the system) led Amdahl to embrace the metaphorical use of the term architecture. Different viewpoints, all showing different, independent, structures of the system, which in the end has to result in one and the same object: the IBM 360. It is the need for all those viewpoints to be interrelated, what triggers the use of the term architecture. “Many people think the roman coliseum is architecture” (2007-2011). But is not. Architecture is a set of descriptive representations required to create or change a building. Not the building itself. The building, like the roman coliseum, is the instantiation of a set of descriptive representations. “We are not now dealing with those primitive instinctive forms of labour that remind us of the mere animal. [...] A spider conducts operations that resemble those of a weaver, a bee puts to shame many an architect in his construction of her cells. But what distinguishes the worst architect from the best bee is this, that the architect raises his structure in imagination before he erects it in reality. [...] He not only effects a change of form in the material on which he works, but he also realizes a purpose of his own that gives the law to his modus operandi and to which he must subordinate his will. Besides the exertion of the bodily organs, the process demands that, during the whole operation, the workman’s will be steadily in consonance with his purpose. This means close attention”. The five rows of the framework have nothing to do with building something, but they are about this “structure in imagination”, before building it. It’s about conceiving with concepts something that becomes perceivable as an instance, once it is build. The mental conception of the artefact to be build, is referenced in the framework by the term reification. In conceiving it, before actually building it, those five rows also create a purpose to which the will (and work) of each participant must subordinate. The structure in imagination is framing literally the work(er), as does a Jacquard loom, in bringing an artefact into being. All changes of form in the material are directed by the purpose conceived within a frame-work. As long as an artisan can conceive and construct an artefact on his own, the conceived purpose and the bringing forth is in the hands of only one subject. But when the artefact becomes more complex, the conception and the construction are separated in different participants, who all do need to share the same purpose: they need to collaborate. Military history shows this same need in the transition of engineers, each serving a military corps, to a specific corps, grouping all the engineers together: le corps du génie in the Ancien Régime, with the fortifications of Vauban (Davis, 1988:10-11). In Concept of the Corporation (1946:10,27,84,142), Peter Drucker is using the French term esprit de corps to refer to this same need of collaboration. Engineering a corporation. Drucker tries to imagine this concept of a new kind of institute, a corporation, that is organizing the industrial human effort to a common end, so that it arouses the loyalty of their (mostly middle-class) members. Surely, leadership is identified by Drucker as the main problem. Along with the policies of decision making: not choosing on personal power, but based on “the impersonal criterion of a supreme law”. And finally, that same law is an issue: how to create an objective yardstick of every human effort. But In the end: “The question always remains to what purpose the machinery is to be used”.8 With all the instantiations of a corporation since 1946, these issues concerning this concept surely remain topical in the everyday flow of newness. Within the framework the participants need to collaborate. Zachman concludes in a NIST-workshop on integration (Fong & Goldfine, 1989:121) that the framework embodies this same idea of unifying people around a same purpose in action (an enterprise), as to gather everyone in the same body, that acts as one (a corporation).9 In conceiving the same (isomorphic and isotopic) purpose, to be shared for bringing an artefact into being as an instance. The framework has nothing to do whatsoever with the plannable process of the work to be done, nor is it a methodology prescribing how to proceed with the work. The framework contains the poiesis: the structure in imagination of what it is to be conceived and to which all the work of all the participants subordinates, in order to bring it into being as an instance. The six columns of the framework are called the interrogatives, being the descriptions of a product: what, who, where, when, why and how. Each interrogative has an “autonomy, although they remain inextricably related” (1978:282). In distinguishing each of these interrogatives as an independent variable, Zachman (2015) feels indebted to P. Duane “Dewey” Walker, as he separated the how (process) from the who (organization) and the what (data) from the how. An organization can change, but the process remains the same. Or we might do different things with the same data. Zachman extends them with three other interrogatives: where, when and why. The interrogatives can be traced back to journalism, where they are used as a rule for presenting the daily news: every article must answer all those questions in the very first lines of an article. Journalism borrowed them, where else, from rhetorics. The 5 W’s are an English translation (made by Thomas Wilston (1560) in The Arte of Rhetorique) of a rhetorical figure, known in Latin as the 5 Q’s: the peristasis, designating the (attendant) circumstances of an act. In different variations, this figure has survived throughout history, as part of a larger category of rhetorical figures, all describing reality from different viewpoints11 The peristasis represents the act, but it does not limit the act to the classical relation between a subject and a predicate: it describes the act in relating all the particular circumstances of the course of an action.12All six columns of the framework together incarnate this rhetorical figure: peristasis. In the evening, on a theatre stage, the lips of Lily are kissed by her antagonist, as the theatre play prescribes to do so. But the antagonist is abusing of the situation, as he tries to steal a real kiss. To Lily, it’s not done to violate the rules of make believe. Showing a simple kiss, circumstantiated differently, is for Sirk enough to evoke the eternal battle between love and law as an intrigue for his movie. And a mother teared apart by it. Playing with the (combination of the) possible circumstances of an action is the charm of any good storyteller. And is not every enterprise in need of a good story, fitting the circumstances ? The object to be instantiated by the framework has not been clear from the beginning. Although the latest version of the framework indicates that the artefact is the enterprise, Zachman mentioned in the beginning information systems architecture (ISA), because “in the early 80’s, the world was simple not able to grasp the concept of Enterprise Architecture” (2007:2). Although Zachman is using this concept already in 1982 (32,53). But to avoid misunderstanding, another one is introduced: ISA. But ISA and the enterprise might not be that different after all. Zachman discusses ISA for the first time in 1978, introducing it as part of a framework for planning. 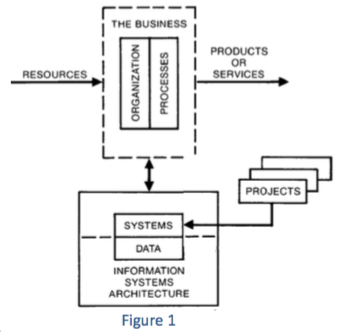 To present the problem, Zachman identifies three components, which are shown in figure 1: the business, ISA and the projects. As only projects and systems are visible to the management, every project and system exists merely on a stand-alone basis. That’s where the framework comes in, by defining a fourth component to integrate all efforts into a “whole”: a strategic plan, positioned between the business and ISA. Zachman abandons such a planning framework in 1987, when he presents that same “whole” as a logical construct: a framework for ISA. Not only because conceiving the object to be instantiated (poiesis) is primordial to planning the work to be executed (praxis) in order to create the object. But mostly because not the strategic planning, but the conception of that object to be instantiated is primordial in binding the business and ISA into a “whole”. While introducing the framework, Zachman concludes exactly with this shift: “There is not information systems architecture, but a set of them!” (1987: 291). One perspective of that set is the business depicted in figure 1. Another perspective is the ISA depicted in figure 1. Both are integrated into one “whole” by a framework for a set of ISA’s, representing (the instance of) an enterprise. And instead of the plan(ning), it is in 1987 the middle row of the framework that unifies the business and ISA: the architectural perspective of (systematic) representation. The context of the framework in 1987 is different from the context in 1978, but the shift made by Zachman, in moving from strategic planning to the logical construct of a framework, is radically different from all other architectural frameworks, which have been developed after 1987. Steven H. Spewak (1993:11) does illustrate this perfectly, as he makes exactly the inverse move as Zachman. Spewak brings the subject of enterprise architecture back to the context of a planning framework. And his interpretation of the Zachman framework, shows very well what is getting lost in this inversion. The one thing, most precious, for choosing the word architecture: interrelated perspectives. They disappear as the first three columns of the framework are re-interpreted by Spewak as “three kinds of architecture”: data, applications and technology. The columns of the framework are reduced to different domains, on a stand-alone basis, in a single dimensional model (2007:10), as there are no more perspectives. Representing what can be further specified and configured by means of technology/tools. The definition of ISA provided by Zachman in 1978, tells us what material this double sided mirror is made of: “the sum of all information flows, structures, functions and so on, both manual and automated, which are in place and/or required, to support the relationships between the entities that make up ‘The Business’” (1978:9). The business is made up of information and technology and tools provide the support for it. And the only way to integrate all perspectives into a “whole”, is by means of information as a unifying component: the informational representation of what the business needs and what technology and tools provides. Doing business might be about money, but the business acts on the informational representation of money. Comparing the primitive predecessors of the framework, Zachman (1982:31) formulates it even more clearly: in the end, the aim is “to describe a business at the enterprise level in terms of information characteristics”. And that’s precisely what the framework does, in representing these information characteristics to describe a business as the attendant circumstances of an action. An action transforming the informational representation. As seen from different perspectives. The nature of the informational representation is not an object, like data. Data (what) is just one of the circumstantial columns. An important one, being the 1st of the framework, which has received a solid foundation with the relational model of Edgar F. Codd. But information is not an object: it is an act, to be described with all six circumstantial columns. Announcing, after the concept of the corporation, the coming of another new (information-based) organization, Drucker (1988:46) defines information as “data endowed with purpose and relevance”. The act brings along the purpose and that’s why the nature of the informational representation is not an object, but an act, including all six circumstances. The framework contains not only the informational representation of money, but also all the circumstances of every act, transforming the informational representation of money. The framework represents information as an act: an informational act. The search engine of Google illustrates information as an act. Following the guidelines of Aristotle, Google tries to know as much as possible of the particular circumstances of each search act, to produce quality information, like advertising. And is the relapse from an information age to an era of big data not due to a lack of knowledge about the particular circumstances: reducing data to a desolate object, without the IQ required for business intelligence to produce the purpose and relevance, once imagined in our wildest dreams. So in the end, the framework is conceiving an enterprise as a structure of informational activities: as if the framework articulates information, whereas architecture articulates space. Conceiving an informational enterprise: an enterprise apprehended by the informational acts it performs. Zachman does not limit ISA to automated information systems: ISA is about both, manual and automated. Some support is likely to be automated, represented by the box within the ISA-box in figure 1, showing systems and data. But ISA is the larger box, including, beside automated information systems, also manual support. And this manual support is also an information system, even if the order of a client is written on a piece of paper. Drucker (1970:19) illustrates such (prototype) non-automated information system with the Armee Deutsch, an army in Austria prior to 1918. They used a language of fewer than 200 words, all designating a possible action, to support their army business. That language was their (non- automated) ISA for running the army. A report of the House of Commons in Great Britain (1870:105) provides another example. In an investigation of railway companies, one participant remarks: “We have also another system in operation [...] which I may denominate as the information system, that is to say, it gives information of the trains that are upon the line several stations in advance”. The information system was quite simple: for fast trains, every station dispatched a message by telegraph to the next three stations. Delivering information as to foresee a future situation, they are unable to see for themselves. That was their ISA for supporting the business of running trains. Any enterprise is a combination of different codes, of different information systems, both manual and automated. Using them is the praxis. Knowing how to use them is the techné. Understanding and conceiving them as a “whole”, is the poiesis. The framework embeds the code of the attendant circumstances of an action regarding the informational representation, the informational act, for conceiving (a set of) information systems, which need to integrate into an enterprise. Once the architectural perspective of (systematic) representation is in place, those architectural representations can be specified as a technology and configured as a tool: ledger and pen or one (or even more) automated account systems. Technology is not about things, affirms Drucker (1970:41-46), technology is about work: “work might provide one unifying concept which will enable us to understand technology both in itself and in its rule”. Technology organizes work in calibrating individual and collective efforts, as already discussed above in terms of purpose and poeisis, to which, as far as the frame-work is concerned, the techné and the praxis are subordinated. This shift from technology as a thing into organizing the work is the same shift from the object to an action, as with the information. Technology provides us with tools that intends to amplify the human power to act, in overcoming the limitations of the human body. The first informational revolution was the invention of writing (Drucker, 1998: 58). Plato tells us in Phaedrus, the story Socrates told on the inventor of writing, Teuth: it will make the Egyptians wiser and give them better memory. A boost for the act of storing and retrieving information by means of the technology of writing. Thamus, king of Egypt, doubts if it will succeed in this intend: it will create forgetfulness, as people will not use their memory anymore. Nicolas Carr (2008) is questioning the Teuth of our times: is Google making us stupid? But whatever the diminution caused, glasses, axes or a CPU overcome somehow a weakness of the human body in using technology and tools. But the focus should not be on the technology and the tools: it is about the work this technology and tools amplify. Google Glass might for some be a gadget, but for those conceiving it, it must fit the work(ing) of the eye. In the context of the framework, technology and tools need to amplify the informational act, as performed by an enterprise. An act defined from a business perspective and represented by a systematic perspective, before becoming available to the perspectives of technology and tools. Zachman (2007:5) repeats it endlessly: It’s not about building and running systems. Drucker (1998:58) writes the same: “No longer the focus on the “T” in IT but on the “I”. Doing business is about informational activities, in amplifying those, represented by the architectural perspective, with technology and tools. Last but not least, there is the content of the cells in the framework. Zachman is very precise about them, in separating primitives from composites. Used for the first time in relation to the graphs of Sowa (1992:608), the primitives becomes more apparent in articles from Zachman in 2001 (Fatal Distractions) and 2002 (Enterprise Quantum Mechanics). The need to distinguish primitives and composites is a consequence of the difference between architecture: conceiving an object, and application development: building an object. Building results in composites, situated at the (non- reusable) level of an instance, like the roman coliseum. Conceiving is about concepts: the descriptive representations of the framework. When Zachman designates these descriptive representations as primitives, it implies a specific way of how to “perceive” these concepts we are imaging in our head. A specific way of thinking, that goes way back in history, even before Gottfried Wilhelm von Leibniz. But Leibniz is certainly what we like to call an important key-figure, as he really has set out the issues regarding primitive concepts and in inventing a calculus. A kind of ”algebra of thought”, which is also recognizable in the work of George Boole, on which Shannon wrote his master’s thesis in 1937. Norbert Wiener did choose in 1948 Leibniz as the patron of his cybernetics, because he invented universal symbols for a calculus of reasoning. A whole movement, focussed on the binary code to create artificial intelligence, is the context of this specific way of conceiving “computable” primitives. The framework is not about the binary code. It is about the code of the attendant circumstances of an action. But in considering the circumstances in each cell as a primitive, we can “compute” an informational act, in combining the same collection of primitives in different ways. And in combining all these informational acts, we can “compute” an enterprise. Such a combinatory principle is not possible with composites, like the roman coliseum, as they are instantiations. Primitives are concepts of an elementary nature: non-dividable, independent variables. Like a prime number, the letters of an alphabet or the elements in the periodic table. The content of the cells in the framework need to fit the algebra of this “primitive thinking” as a combinatory principle. But within the cell, each primitive is not a stand-alone element: there is always a relation between two “primitive” elements. In representing time (when), it is an interval, relating two “primitive” moments. In representing space (where), it is a connection, relating two “primitive” locations. In representing people (who), it is a work product, relating two “primitive” roles. These relationships are very important, as it prevents stand-alone circumstances: all circumstances in a cell need to interrelated, before combining them with circumstances in another cell. Each cell is not only a collection of primitives: it represents a particular system of a specific type of circumstances. Combining circumstances from different columns, results in relating relations between these primitive circumstances of each cell. Combining a moment and a certain location, implies another moment and another location, as the interval and the connection are related. Conceiving an informational act, is relating relations, predefined as a primitive possibility in the systematicity of each cell. Pragmatically, it is about framing one and the same purpose of action (poiesis) for different participants. The framework revisited shows us a way of conceiving an enterprise in terms of information as an act: the informational enterprise. No writing on information can do without addressing communication, as it is its cradle. The informational act is directed towards things, to be transformed, like in our case descriptive representations. The communicational act is directed toward human beings: the sender and the receiver. It presupposes the transmission of an object between these two, but whatever is communicated depends on what happens at the subjective position of the sender and the receiver. In his technical and critical philosophical dictionary, André Lalande (1925:229) gives two definitions of the verb to inform. The first one is to give form to matter. This definition joins the Latin origin of the word, as in Vergil's verses on the Cyclops, using the technology of fire, tools like the hammer and iron as a matter, to make thunderbolt weapons for Zeus (Capurro, 1978). An act to transform things. The second definition abuts on to the communicational act: make something known to a subject. Two short definitions that subsequently are related by Lalande, in referring to René Descartes, who positioned thought as the only instance to legitimise the existence of a subject: informing the matter of the mind. And this mind implies a subjective instance, like a receiver or a sender in a communicational act or as what is to be imitated by artificial intelligence. Ralph .V.L. Hartley (1928:536,538) eliminates this subjective instance, while introducing the “very elastic term” of information, in order to quantify the object to be transmitted in communication: “we should ignore the question of interpretation”. Shannon (1948:379) takes over from Hartley, stating that semantics is non-relevant to engineers. But in the end the door to semantics can not be kept closed. In order to make sense of the communicational act, we need to assume the subjective position of the sender and the receiver.19 It doesn’t matter if both instances do understand each other perfectly, do not understand each other at all (like Montaigne playing with his cat (Sennet, 2012)) or misunderstand each other completely. Whatever happens in the communicational act, what counts is exactly the thing that happens at the subjective position of either a receiver or a sender. Within the context of the framework, this means positioning the informational activities performed within an enterprise, in the outside world: what is the effect of the informational act in the communicational act targeting the customer. That is the challenge at stake in the next information revolution, announced by Drucker (1998). The business value depends completely on this external effect, because without it, information remains dead as a doornail: an object of data to be transmitted. Drucker is teaching us two things about the next information revolution. Firstly, the necessary shift from the in- to the outside. The inward focus depicts the enterprise as a cost-center, like determining the cost of all internal activities. The outward focus aims at an enterprise as a profit-center, addressing opportunities and threats available in the market. And to produce information that makes a difference for the customer in that market, we need a lot of information from this outside world. Secondly, that it is not about technology. We need to focus on the “I” within IT as the meaning of information is changing: that change compels us to reinvent the function and the purpose of the business. Reinventing the business and accomplishing the necessary changes: a radical disruptive discontinuity, not to be underestimated. More than ever before, the framework provides the rationale to avoid the pitfall of technology and to promote information as the key asset of an informational enterprise: as an act, for every participant involved. The framework incarnates the change imposed on every enterprise by the next information revolution: they will all have to reinvent their business likewise. Internally. But mostly to conceive the external informational activities, one likes to trigger within a customer in establishing a possible communicational act.20 Without any guarantee that the conceived act is actually being instantiated by the customer. Reinventing business for the next information revolution requires the conception of an informational customer. When Aristotle is writing about the particular circumstances of an action, the context is ignorance: lack of information. When the long term is concerned, we need, at least, “to know enough to organize our ignorance” (Drucker, 1970:125). Being rational and informed is one way to organize our ignorance. And it seems to be our duty: because an immediate gratification might in fact be painful and involve repentance on the long term. The duty to take responsibility for the long term: it is surely something that has become an issue in our society. Greed facing sustainability: is the latter able to gain a foothold in a capital driven society ? Describing the issue of the century, Zachman (1997) writes: “There is nothing wrong about short term or long term decisions except, it is abundantly clear, if you exclusively make short term decisions and ignore the long term implications, there comes a time when you will live to regret it. You are going to pay later“. Ignoring the moment, later, where the debt has to be paid, in showing an excess of information: digits extending to infinity, in showing precisely the accumulation of capital due to who, when, where, how and why? It is an excess of data, incapable to transform into any information whatsoever. As solid as the material of other ages were, like irrigating water, stone tools, melted iron or the steam and electricity used in industries, so intangible is the material of our age. And it just might be that our so called information age, is actually about an excess of big data, accumulating endlessly, as a virtual growing debt of what never will be capitalized as information in a communicational act. Mankind seeking refuge in the pleasure of using tools and devices to consume and produce data: once connected, anywhere, anytime and with anyone. Repeating a short term pleasure as an endless (re)quest for an echo of “anyone”, proofing that there is someone at the other side of the line. A confirmation of a magical connection in the virtual cyberspace, whose nature is so erratic, that this echo is everywhere and nowhere, at the same time: “Isn’t it eminent unreasonable to devote oneself to this other, being ‘just anyone’?” (Assoun, 2009). Renouncing at some of that pleasure might bring back a long term cause for communication and information. The framework intends to join such a cause in conceiving an informational enterprise. 1 All references without an explicit author are referring to John A. Zachman. 2 For example BSP includes a definition of information architecture and underlines the role of an architect. And in 1975 Börje Langefors and Bo Sundgren published their book Information Systems Architecture. 3 Zachman uses this word in Fatal Distractions (2001), while discussing “four corruptions of architectural principles”. A malapropism is a rhetorical figure, named after a character in a theater play, Mrs. Malaprop, who uses similarly sounding words instead of the word intended: f.ex. hangover instead of Hannover. 4 In the last version of the framework, the term descriptions is changed to abstractions. 5 Ontologies have become a frequently used term, as the term graph. In his essay From the Tree to the Labyrinth, Eco (2007) positions clearly the problems involved, including the “ontologies” of Sowa. Eco uses another term from Charles S. Peirce, the interpretant, to open up the act of defining things, as in a dictionary, to what a dictionary really is: “a disguised encyclopedia”, culminating in the fantasy of a kind of rhizome. 6 Zachman & Sowa (1992:590) express the need to be able to relate the concrete things in the world to the bits in the computer: they should be two representations of the same something. 7 Isotopy is a concept used in mathematics, chemistry and physics. Algirdas Greimas (1965) extends it to semantics as a way to homogenise an object, in organizing the semantic content in an (immanent) micro- universe: “the categories, constituting the isotopy, can be identified as those that articulate taxonomically the micro-universe” (Greimas & Courtès, 1979, lemma Micro-universe, translation my own). 8 Political philosophy is an important subject of the book, mostly in terms of the problem identified by Alexis de Tocqueville, after having travelled in democratic America in the Ancien Régime: balancing liberty and equality. 9 The National Institute of Standards and Technology (NIST) organized a workshop in 1988, entitled The integration Challenge, consisting of five different groups, of which one was presided by Zachman. His contribution to the workshop in time was minimal (2007:11), but not in writing. Whereas every group published an average of 20 pages, Zachman wrote triple as much. All they did was to make an inventory of all possible integration issues, recognizable in all cells and all relations within the framework. As if, within the framework, alignment is no concern anymore: it is for free, as if it addresses implicitly all issues. 10 In outlining the rationale of the framework, philosophical subjects are imposing themselves, as poiesis. Originating in the old times of the ancient Greeks, they maintain their interest up to today. As Heidegger’s essay The Question Concerning Technology, first presented in 1949 with the title The framework. The imaginary signifier is the title of a book of Christian Metz (1977). 11 To name some authors: Cicerone, Saint August, Matthew of Vendome, Quintilian, Boethius or (the oldest, only indirectly known) Hermagoras of Themnos in the 1st century B.C. 12 Zachman & Sowa (1992:607) quote Lucien Tesnière, C.S. Peirce and semantic networks, for introducing conceptual graphs. The conceptual graph of Sowa, inspired by the “diagrammatic thinking” of the semiotician Peirce, remains close to the traditional subject/predicate relationship. Inspired by chemistry, Tesnière is the first to abandon this classic subject/predicate relationship in developing a circumstantial dependency grammar. It is one of the cornerstones of the narrative semiotics of action, developed by Greimas (1965:VII.3.d), in which the same spectacle (or representation) is reproduced over and over again by a syntactical game of combining these circumstantial categories differently. A semantic structure in terms of human action. 13 The English translation can be found on the internet: classics.mit.edu/Aristotle/nicomachaen.3.iii.html. 14 It is one thing to write something universal, that seems “applicable” to all enterprises. It is another thing to do justice to the particularities of a single enterprise, in formulating an adjusted singular advice. 15 The names of these stand-alone domains vary: business, information, data, applications or technology. 16 Another symptom of this lack of alignment are methods like DSDM, Agile or Scrum : all trying to solve the issue of what needs to be conceived (poiesis), while doing the actual work (praxis). It’s another way of putting the cart before the horse: limiting damage at the most, under the pretext of “close” communication. All participants are desperately seeking to compensate the missing inter-relationships between perspectives. 17 We might even conclude that the term information system is a pleonasm, as without a system, information can not exist. Although information is often perceived as an (transparent) object to transmit: the message. Unfortunately, the concept of information is a too broad subject for here: it will be addressed in forthcoming essays. Here, it is narrowed down to Drucker’s context of a code. Such a code can triumph in attaining “its perfection in the transmission of the message” (Metz, 1964:51), as in the work of Claude E. Shannon on the reproduction of a message. Or in the perfection of not transmitting it, as in the work of Shannon on secrecy systems that intend to conceal the message. Both, in striving for perfection, have noise as their counterpart: the imperfection, disturbing the code. But even noise can be considered as a message (Shannon, 1948: 406). 18 Understanding “primitives” in the context of the interrelated perspectives of a system and a process might help to prevent the composite thinking, still very prominent in IT: “a totality does not consists of things but of relationships” (Hjelmslev, 1943:23). Hjelmslev explains the fundamental aspects for describing any signifying system in his instructive lecture of 1947 on the basic structure of language, published in the French translation. Another aspect are two (interrelated) planes: expression and content, constituting the (semiotic) sign function. 19 The Bell Telephone Laboratories, even after Hartley, imagined this subjectivity as being part of the object to be transmitted: communication for them was “the transmission of intelligence” (Nyquist,1924: 324). 20 No extra row within the framework is necessary to do so. Nor the user of an information system needs to be represented in the framework, as Sowa (2011) suggests. Both consume the instance of the object conceived. Amdahl, Gene M. & Blaauw, Gerrit A. & Brooks Jr., Frederick P.
Fong, Elizabeth N. & Goldfine, Alan H.
Greimas, Algirdas J. & Courtès, J. 2012 Together. The Rituals, Pleasures and Politics of Cooperation. Allen Lane. Zachman, John A. & Kappelman, Leon A. 2013 The Enterprise and Its Architecture: Ontology & Challenges. Journal of Computer Information Systems, Volume 53, Issue 4, 87-95 Zachman, John A. & Sowa,John F.
Paul Hermans has an education in semiotics, business administration and computer science and over 15 years experience in the increasingly complex playground of people, information, enterprise and technology, always aiming to accomplish customer value and change. He can be reached at . © 2015 Paul Hermans. Unauthorized use and/or duplication of this material without express and written permission from the author is strictly prohibited. Excerpts and links may be used, provided that full and clear credit is given to Paul Hermans, www.zachman.com and www.semiosis.info with appropriate and specific direction to the original content.